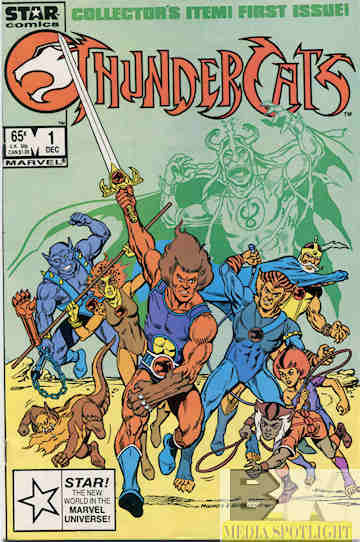 Created by Ted Wolf, Thundercats was a 1985-1989 cartoon about space refugees from the doomed planet Thundera. (The emphasis should be on the “der”, Thundera.) It was a very popular show with kids of the time who are still nostalgic for it as an adult. There was an attempt in 2011 to bring it back. The lore was all wrong but the show itself was quite good and did at least try to adhere to the spirit of the original. And now we have Thundercats Roar coming out, turning a popular action show into a cheap joke as the only offering outside of watching the old shows which won’t be airing at the time. I wanted to track down the story bible for this show because I thought it would be interesting, just like I did with Batman: The Animated Series and just recently completed a look at the Star Trek: The Next Generation season one writer’s guide. I was not successful but I may try again someday. I find these interesting. 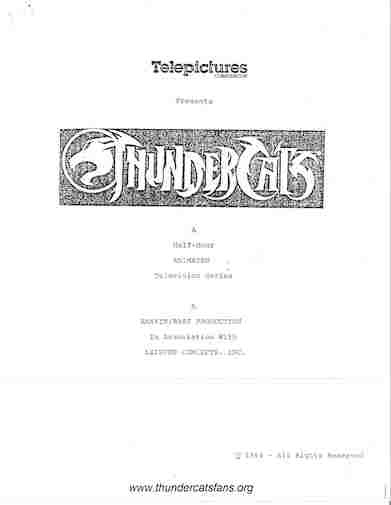 However, what I did find is an early show pitch for the original Thundercats. You can read along with me on this one thanks to a contributor to the fansite ThunderCatsFans.org. The contributor thought she was buying a story bible but instead ended up with a 1984 pitch from Telepictures (before it was bought by Lorimar) for the show. The pitch was written by Leonard Starr, one of the regular writers for the show. The pitch is five pages long, and seems like an early draft for “Exodus”, the first episode of the show. While there are some minor changes (it might have been based on an early draft for the pilot if that) what makes it interesting is that the names were changed between the draft and the final show. The pitch opens talking about the “wagon train” leaving Thundera, which slipped out of its orbit and was getting too close to the sun. I forget the reason given in the show, but I do remember it pulling a Krypton. That’s in line with the pilot but then we meet the crew. Aboard the lead ship, the commander, Jagu-R, an elderly warrior type with jaguar spots, etc., is checking astral charts on a tele-screen. Standing beside him is the young lord Lion-L. He is about ten years old and human-like except for his leonine mane of hair. Also in the control room are other the nobles of Thundera–Cheet-A, Panth-R, Tige-R, Wily-KT–the Thundercats. If you thought Jaga, Lion-O, Cheetara, Panthro, Tigra, and Wilykit were too on the nose, it’s still better than these names. I understand it in theory. It’s a different naming system, like how Vulcan women have names like T’Pring and T’pol. However, it seems kind of lazy to take “cheetah”, drop the a, and toss a hyphen in. And why does Wily-KT get two letters when everyone else has one, including the young lord? Did he come from a rich family? Speaking of which you’ll notice no counterpart for Wilykit, Wilykat’s sister. She’s not in the pitch, but we do later see Snarf, one of the few characters to keep their name, is there but I don’t think the design they intended matched what we got. It is somewhat like a sheepdog, but with space creature characteristics (horns, scaly feet, etc.). Its name is Snarf and it persists in thinking of Lion-L as a child even when he has become a fully-grown superhero, worrying about his going out in bad weather, making him finish his food, clumsily trying to pull him out of harm’s way, thereby occasionally messing him up. He can also be fierce when pressed, overcoming his natural gentleness when Lion-L is in danger. Okay, he didn’t actually lunge at Mumm-Ra with the Sword Of Omens, but he did rescue the other Thundercats with only a spider, a bat, and a woodpecker so you’re argument is still invalid. Speaking of the Sword, it isn’t given a name in the pitch, but that thing in the center is, as described when the Mutants make their attack. “Eye Of Xanth” instead of “Eye Of Thundera”. I don’t remember the Eye Of Thundera showing the future. Also, you look into the eye itself rather than through the hoops in the hilt. I wonder about the “lidded” part. Was the Eye supposed to have a closing lid or was the lid part of the unnamed sword? This of course was changed so that there was no lid necessarily but the symbol in the jewel would look closed until activated, looking more open and glowing with power unless its full power was called on and it would change to the Thundercat insignia. Also, it doesn’t look like the Eye in this case can send a signal to summon and boost the Thundercats. During the ship crash in this version Lion-L has to go to each stasis pod and use the sword to open it, which I grant could have slowly dropped the tension rather than just waking everyone at once, but you wouldn’t get the “Thunder…Thunder…Thunder…Thundercats…HO!” cry that would be forever linked to the show. Don’t underestimate the power of a good battlecry, invocation, or catchphrase. Done right, especially in a kids show, it does wonders to get you excited. Even the remake knew that. Other changes: I don’t think the “special clothes” thing (where the Thundercats are running around buck naked) in the pilot doesn’t show up here, and was abandoned in the show anyway. I don’t know if they forgot, realized how silly it was, or if parent groups complained despite them having the genitalia of Barbie and Ken. There’s no mention of new clothing or the lack of any beforehand, but it does mention that Jagu-R still goes out Obi-Wan style and can be summoned to advice. Although it’s not clear if that’s exclusive to Lion-L as it was with Jaga and Lion-O. The Thundercats also kept their unique skills, although Panth-R isn’t listed as a techie. He’s listed as a “nightfighter” with acrobatic and martial arts stills. Tige-R is still a camouflage expert, Wily-KT is a prankster who get in over his head (Wilykit wasn’t smarter than Wilykat so much as more focused and less of a showoff–girls mature faster after all), and Cheet-A has superspeed but no mention of her psychic abilities. Lion-L’s personality is the only one set besides Wily-KT, in the line “They vow loyalty to young Lion-L, smiling indulgently as the youth brashly declares himself capable of taking care of himself”, which makes him sound like a bit of a jerk. I’m glad they toned that down. Probably the biggest changes come from the locale and the villains. This wasn’t Third Earth, this was THE Earth. Our Earth. While it’s not made clear what time period they were in it is clear that this is Earth. Specifically they crash in Africa, and this plays into how the future episodes, which are suggested in the pitch, would have played out. The Thundercats, having found themselves on the planet called Earth, will fight the forces of evil drawn from our existing history of the regions surrounding Africa, Egypt, and Southwest Asia. Stories, concepts, and sketches will be realized from the whole of mythology. Kind of like Gargoyles did, in a way. The evil mutants will fall under the leadership of the evil mumified priest, Mum-Ra. One “m”, not two, but since they spelled “mummified” wrong I’m not that surprised. I don’t know if Mumm-Ra was a priest in the show, but this was put into his origin in the WildStorm origins specials so I guess there was a basis for it. S-S-S-S-Slithe keeps his name intact though none of the other mutants are named. It also says that he would “assume such forms from Genghis Khan, Medusa, Circe, as well as other legendary demonic beasts”, which sounds more like Mumm-Ra’s gimmick. That’s the part that makes the time period uncertain. Medusa and Circe come from Greek mythology and stories while Genghis Khan is from Mongolia and fairly more recent. The pitch also mentions using elements from Atlantis and the Sphinx as examples of stories they’d like to tell while the Thundercats would join the lynx god Maftet in fighting various mythological threats. I’m assuming that either Mum-Ra wasn’t going to be the only big bad or that Mum-Ra and Maftet weren’t best buddies. According to Wikipedia Maftet (also written as Mafdet) “was a goddess who protected against snakes and scorpions and was often represented as either some sort of felid or mongoose” not a lynx god. I wonder how that screw-up happened? The Mutants were also going to use mole men, vulture men, and rat men as a monster force, which sounds less like Vultureman and Ratar-O and more like the Marvel Universe Mole Man. 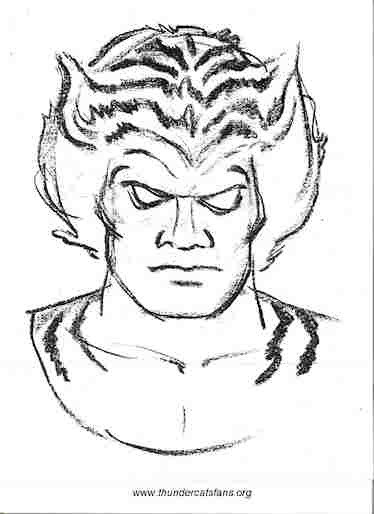 The pitch ends with this sketch of Tige-R, looking more like Lion-O than Tigra. How much of this ends up in the actual show? We do see elements of Earth in Third Earth, and hints that it might have been First Earth (our place) at one point. 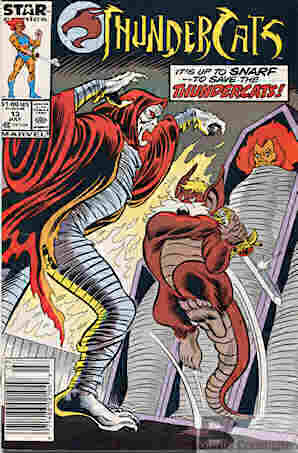 King Arthur is part of that planet’s history, Mumm-Ra still has the Egyptian motif from his mummy form to the pyramid to the designs of the Ancient Spirits Of Evil (even if the gods they resemble weren’t necessarily evil in Egyptian mythology), and other elements popped up in both the show and non-canon comics from Star Comics and WildStorm. It just wasn’t as strictly followed since they didn’t crash on our Earth. Obviously the Thundercats are more fleshed out, given better personalities, another member who would become the “Thundercrush” of a certain eleven year old, and the Code of Thundera–truth, honor, loyalty, friendship. The lore of the Thundercats were also advanced with numerous artifacts that probably wouldn’t have made it into an Earth-based show and not being restricted to Earth while still having the opening to be inspired by Earth lore and myth allowed to create a mythos that was all their own, which was definitely to the show’s benefit. Overall though it does feel like a different show that just has the same elements in the pilot. There could have been a good show here but I think the Thundercats we got was a better show. Other shows like this would pop up afterwards, as refugee aliens would end up on Earth, fight Earth-style threats alongside the space threats that either came with them or they were after, and the heavy myth elements have also been done elsewhere. The names are certainly better and they toned down Lion-L and Snarf between Lion-O and…Snarf. There might be some ideas here that would make for an interesting show but I think we got the better Thundercats. Posted by ShadowWing Tronix on February 6, 2019 in Animation Spotlight, Story Bible Reviews, Television Spotlight and tagged early concept, story bible, ThunderCats (1985 TV series), TV pitch. I also like the Thundercats that we actually ended up with. Although it would have been cool to see Medusa, Genghis Khan, and minotaurs popping up in the Thundercats cartoons. Hey, we did see griffins in one of the early 21st century Thundercats comic books though. I’m just glad that Snarf didn’t end up being like the creature portrayed in the sales pitch. It’s better having Snarf as a cat like being instead. I wonder what the sales pitch and story bible for Thundercats Roar looks like. I would say a lot less effort went into the sales pitch and story bible of this upcoming Thundercats Roar.